Is Your Diet Making You Angry? Heat 1 teaspoon olive oil in a skillet over medium heat. 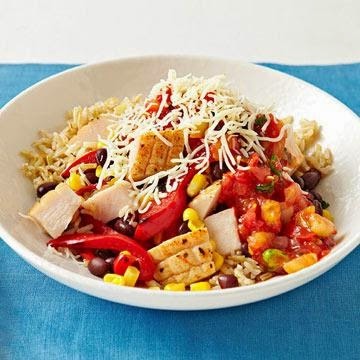 Saute 1/2 cup thinly sliced red pepper, 1/4 cup frozen corn, 1/4 cup black beans, and two ounces of cooked chicken, diced 5 minutes; season with salt and pepper to taste. Chicken mixture over cooked brown rice and top with 1/4 cup and 2 tablespoons 1/2 cup Monterey Jack cheese.